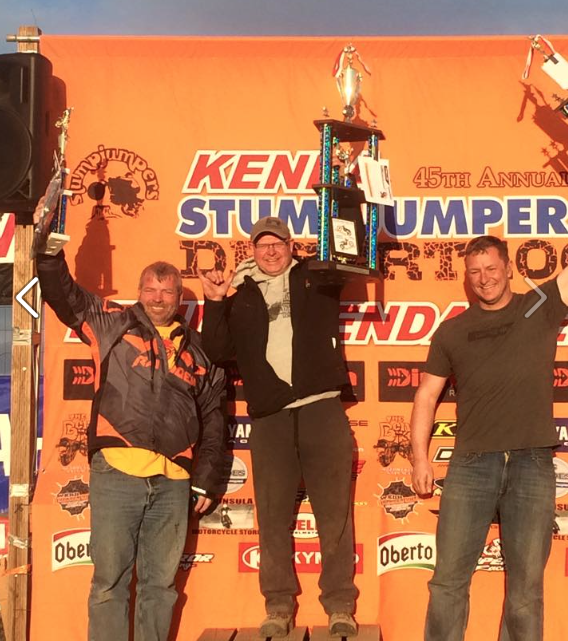 Here are some random pictures from the weekend at the Stump Jumpers Desert 100 Race in Odessa Washington. I don’t know the exact numbers this year but several thousand usually show up to race on Sunday in the desert every year. It’s like a family-oriented Sturgis but with dirt bikes in the middle of a field in Central Washington.The Stump Jumpers set up a Dual Sport/Adventure ride on Saturday morning that was a 140+ mile loop through the farm fields and canyons of Central Washington. I want to pass on a congratulations to the CEO of Cyclops lights, Darryl VanNieuwenhuise, on his podium finish in the Desert 100. He placed 3rd on his KTM 990 in the “650cc and larger” class. Alex Marten of Konflict Motorsports needs a big plug too, he tuned the suspension for the top 3 finishers! Here is the story: Mike Gentry was on his way home from the D-100 on Sunday afternoon. 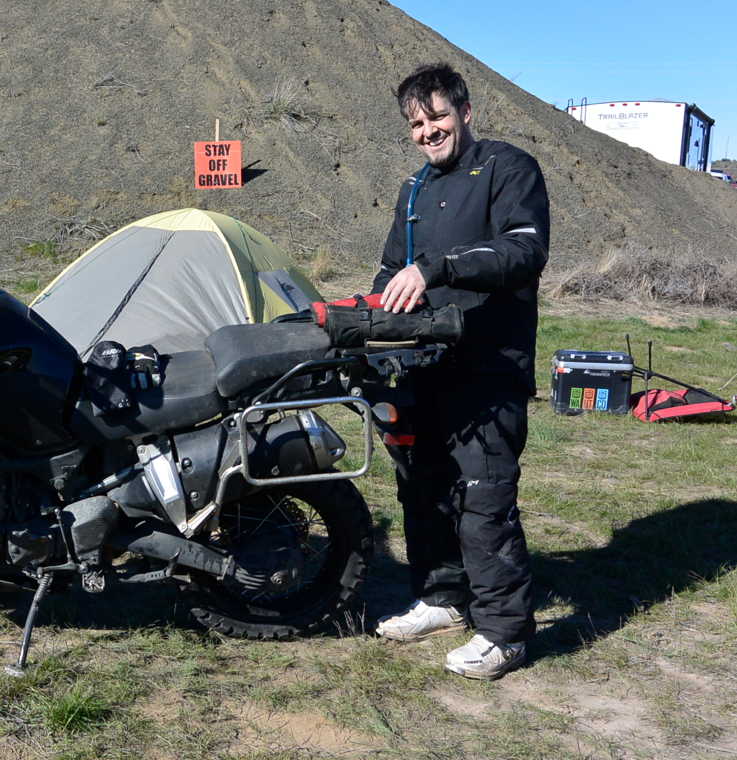 While fighting 20-30 mph cross winds, he didn’t notice when one of his Touratech Zega Pro panniers fell off somewhere between Odessa and Ephrata. He doubled back all the way to Odessa to look for it, but no luck. Luckily, Cody Milner of Selah, WA found it in the ditch on the way home from the D-100. 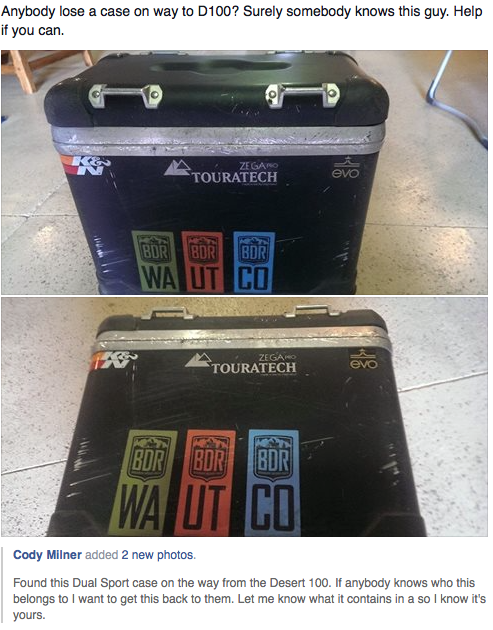 He posted the pictures of it on the Stump Jumpers Facebook page. I recognized the pannier and tracked down Mike with the help of Jeff Haar. I was able to get ahold of both Mike and Cody to get them talking. They have already arranged a pick up. A happy ending through the power of the internet.